Constantly, night and day, he was screaming among the tombs and in the mountains, and gashing himself with stones. In ancient days, epilepsy and psychological ailments were seen as possession by fiends or dark spirits. Spells and incantations murmured by magicians were the only hope of those suffering from mysterious illness. We can understand the suspicion Jesus caused when he cast out these demons and brought joy to common people. The authorities who benefited from the plight of the desperate sought to put an end to Jesus’ constant cures. No one was able to bind him anymore, even with a chain; because he had often been bound with shackles and chains, and the chains had been torn apart by him and the shackles broken in pieces, and no one was strong enough to subdue him. Today, science often guides us as we explore disease and look for healing; yet still some of us suffer from unseen – and misunderstood – torment. When we consider the story of the man possessed by an evil he cannot see and does not comprehend, we begin to understand our own hope for consolation when we are beset by troubles large and small. 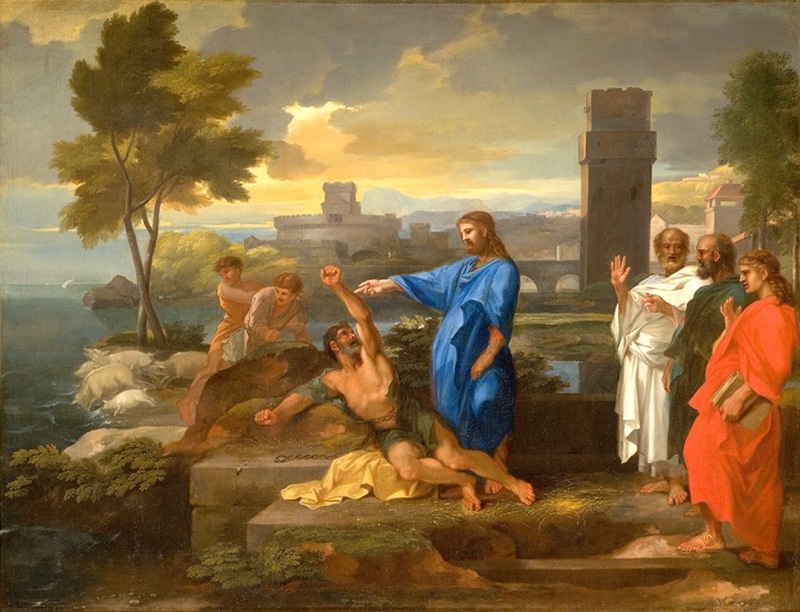 Today as we read this story of the Gerasene, let us run to Christ to fall on our knees as he does. And let us surrender all our troubles to the deep, healing, transforming and abiding consolation of Christ. He was some distance away when he saw Jesus; so he ran, and fell on his knees before him. To explore this blog, click on a tag link, or enter a word or phrase into the search bars above or below. Click on a category to read more reflections . . .
Help us to speak your truth openly in kindness. Guide us to be honest without damaging others. Lead us in your way of confronting hypocrisy with honesty rather than anger. Keep us always in the way of your holy integrity. Be with us always as we walk in your light. We ask this in your name. A prayer to reflect on Jeremiah 39: Living our lives as a gift that we return to God . . .
Just, yet merciful God who sees and knows all, we return our lives to you. We, who have been created by your hand, turn back to you all that we have managed to enact in our lives in your name. We, who have known the protection of your power, fly home to live in you. We, who have been saved by your love, gather all that we are as booty to be taken in by you. In your mercy, guide us. In your kindness, guard us. And in your great love, give us the hope, the grace and the endurance we will need to live in joyful hope for you. We ask this in Jesus’ name. Amen. Reflecting with 1 Samuel 24: A prayer on vengeance . . . Remind us that you give us the gift of life. Guide us in living that life in gratitude to you. Lead us in the life of charity that Jesus shows us; lead us in the life of love to which the Spirit calls us. Bring us to your eternal goodness. Grant us the courage and fortitude to forswear vengeance even when we are urged on by friends. Keep us ever in your heart and mind. your plans for us are too vast and too complex for us to understand and so we stand before you – humbly – returning to you after having gone off on our own. We listen, we watch, and wait for your word. We seek your understanding and we yearn for our completion in you. We witness as we watch and wait. Allow us to feel and acknowledge your presence and power in our lives. Continue to call us and to forgive us, your loyal and faithful servants. Remain in covenant with us, and keep us in covenant with all humankind, even as Jesus does. Bright and beautiful God, you are so patient with us as we flutter in your hands, wanting to be near you yet insisting on our independence. Good and gracious God, you are so merciful in your forgiveness, allowing us to find our way, never leaving our side and always welcoming us home. Perfect and holy God, you give us the gift of life, and you call us to discover our present as the fusion of our past and future. Help us to see that all time is yours . . . and that the most important moment is now. Guide us to live and act in you alone. Beware of the Leaven: A Reflection on MATTHEW 16:5-12 in prayer . . .
Good, and honest God, abide with us and strengthen us. Keep us close to you. Remove our deepest fears, bolster us with your certainty, and bring us into a place where the cares of our daily struggle will not overwhelm us. You promise us your eternal happiness. Keep us mindful of you just as you are mindful of us. Guide us away from the leaven and keep us from the puffing up in pride. Lead us in the practice of your “new teaching”. Protect us with your loving care. Bring us peace in you alone. We ask this in Jesus’ name.